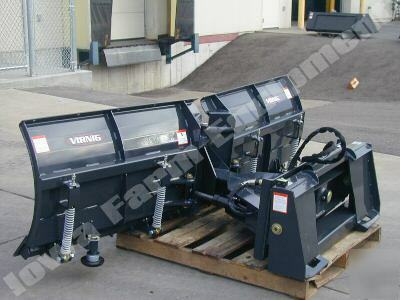 Brand New Virnig Model SBV84, Skid Steer Snow V-Blade. Works in "V", Scoop, Straight & Angled Positions!!! * With Hydraulic Only Control (no wiring to have to hook up), this Blade can be used in the "V", Scoop, Straight & Angled Positions. * Hoses & Flat Face Couplers! * Trip Edge is Spring Loaded with 4 Springs! * Reversible Wear Edge is 5/8"x8". * Blade Oscillation allows the edge to follow uneven surfaces. * Recommended for Loaders with Operating Capacities greater than 1500lbs. * Blade Angle is 30 Degrees. * Width at Full Angle is 74". * Width at Full Scoop is 70". * Width at Full "V" Position is 76". * Moldboard Thickness is 019". * Cutting Edge is 5/8"x8" Bolt On . * Center Rubber Edge is 1"x6.5". * Blale Oscillation is 8 Degrees. Plus, We are Glad to say, Virnig Products are MADE IN THE USA!! !